but the memory of their being there. 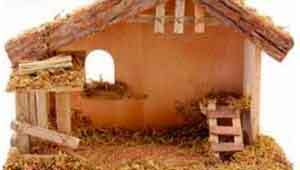 All through Advent we have been challenged by Luke to keep watch and remain expectant for the coming of Jesus. But the stable scene itself reminds us that what we would see as wonderful is more often than not hidden in small and seemingly insignificant things. We tend to sanitise our Christmas preparations and final celebrations, with sweet children and fluffy white sheep and carol singing (all beautiful, to be sure), and lots of food and family gatherings, not to mention canned music in supermarkets and tinsel galore. However, the truth is that things were not so pristine. The shepherds, for instance, were despised. They spent much of their time outside the safety of the city, out in places that were suspected to be inhabited by bad spirits, often grazing their sheep on other people’s property, and certainly away from synagogue or temple. Mary might have been attended by the innkeeper’s wife, but we don’t know. Joseph had to make do with whatever was at hand to protect and warm his new child. Perhaps now, if Mary had given birth in a warehouse, for example, he may have used a cardboard box stuffed with bubble wrap. The whole scene was fraught with difficulty for all concerned. And yet…..and yet…..there he was, the Son of God, a tiny packet of flesh, wrapped in his mother’s shawl and tucked up in the hay. And this is surely the Christmas message – that Christ more often than not comes in the chaos and messiness of our lives, into our grief and anger and fear and irritation. So cleaning out our stable should be done with care, because we might evict the very things that reveal to us the deep, deep love of Jesus in our lives. Our call is to develop the eyes of faith so we can recognise him and trust him with our mess. Sr. Sue Nirta (Spokesperson) continues with her theological studies at St. Barnabas College. Her daughter, Kai, had a baby in February, so she is also kept busy baby sitting while Kai works as a teacher. Unfortunately, Sue’s brother Brian died recently, yet another family member to lose in the past few years. However, she has been asked to take up lay preaching duties at her church – something she looks forward to eagerly. Br. Martyn Robinson keeps busy with his veggie garden and building his little boat, ‘The Ark,’ as well as singing with the Sing Australia Choir. He ministers to the neighbours and to the men at the Copper Coast Christian Men’s Group, as well as to his own congregation in Wallaroo. Sr. Pauline Treloar spent some time in hospital earlier this year with broken ribs after a fall in her garden. However, she is still as active in her church as she can be, given her ageing and limitations. Her family brings mixed blessings, but she is a faithful witness to the love of Christ in her life, and shares it as much as possible among friends and family. Sr. Bev Driver recently suffered strokes and is rehabilitating at the Repat Hospital. Before that she had retired from her duties as sacristan at her local church, St. Margaret’s, McClaren Vale. Sr. Cheryl Wiseman still nurses at the New RAH and is involved in Stillpoint Ministries, as well as her own church. She has has some health problems, but continues her work cheerfully. Sr. Riccarda Favorito works at a nursing home, as well as caring for her own husband, Nick, who has dementia, and carrying out pastoral duties in her own church. Sr. Katherine Thorpe, cheerful despite health issues, is our ‘connector’. We inform her of any needs for prayer, and she texts us all with the information. Sr. Susan Coleiro, our newest member, has also been dealing with health issues. Her ministry is in chance encounters with neighbours and people on the street and in shops. She lives in Gladstone and has made connections among many townspeople. Br. John Edwards is in palliative care in Maitland hospital. He is 89 and suffering from dementia. Sr. Sandra Sears is back in harness after a bout of depression which kept her sidelined for six months. However, the enforced rest period meant a deepening connection with God in prayer and meditation. She still writes poetry (one of which is printed here), stories and music. have around, and it wonderful to bounce ideas for sermons off of. He does most of the cooking, which is vegetarian and no salt – wonderful for the blood pressure! – and is hoping begin teaching CPE courses in the Diocese next year. 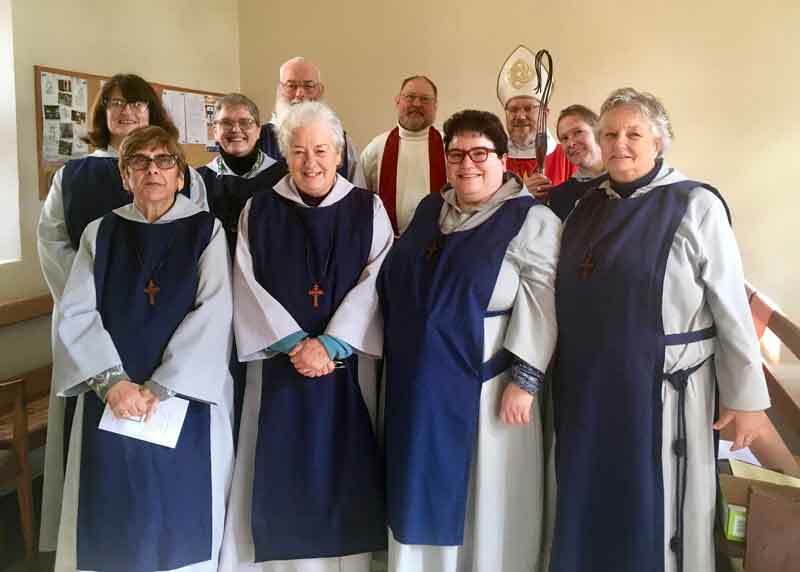 The house has hosted several community gatherings over the past year, including our retreat in June, when we renewed our vows, with Bishop John Stead, our Visitor, presiding. Sr. Susan Coleiro made her first vows, and was clothed. It was a wonderful celebration. Back row: Srs. Sue Nirta, Sandra Sears, Bro. Martyn Robinson, Fr. Simon Bailey (Chaplain), Bp. John Stead (Visitor), Sr. Cheryl Wiseman. There have been several visits from members staying over for a few days at a time. Sr. Cheryl visited in August when the three of us went to the Caltowie Pub for a meal, after which she and Thay played eight ball (Photo right). Could this be the future of religious communities? Our Community has been supporting Temanakali school (or St. Andrew’s) in Uganda run by Pastor Paul Kiviiri, whom Br. Martyn met on a bus travelling to Adelaide a couple of years ago. 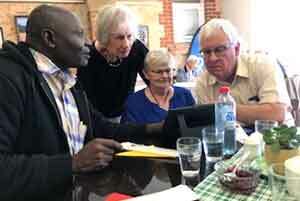 Paul pays regular visits to Australia to catch up with sponsors and talk about his work and the school of about 450 children, many of whom live in. He relies almost exclusively on donations to maintain the school, which is in rural Uganda, and serves the poorest communities. and spoke at various meetings around the Copper Coast. 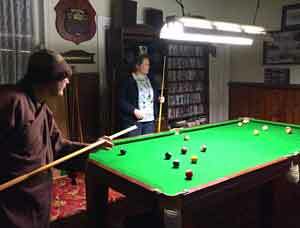 The photo (left) was taken at Christ Church, Kadina (Parish of the Copper Coast). His visit was picked up by the York Peninsula Country Times, so we hope it will generate more income for the school. May your Christmas celebrations include playing with the Christ Child, as well as praying with the Christ Child – the One who journeys with you throughout the coming year.